This bracelet is a combination of riverstone, jasper, silver, ceramic, picasso and crystal beads. It's a mixture of wine red, black, silver grey and a blueish-grey beading. There are two handmade charms on the ends. It stretches to fit most wrists. The colors on this are very rich. It fits a wrist of 5.5 to 7cm because it stretches. Memory wire maintains its shape, no matter how it is twisted or stretched. Instead of using a clasp, you wind it onto your wrist, making it easy to fit any wrist shape and almost any sized wrist. No more guessing if it will fit or trying to fuss with a clasp when putting it on or taking it off! 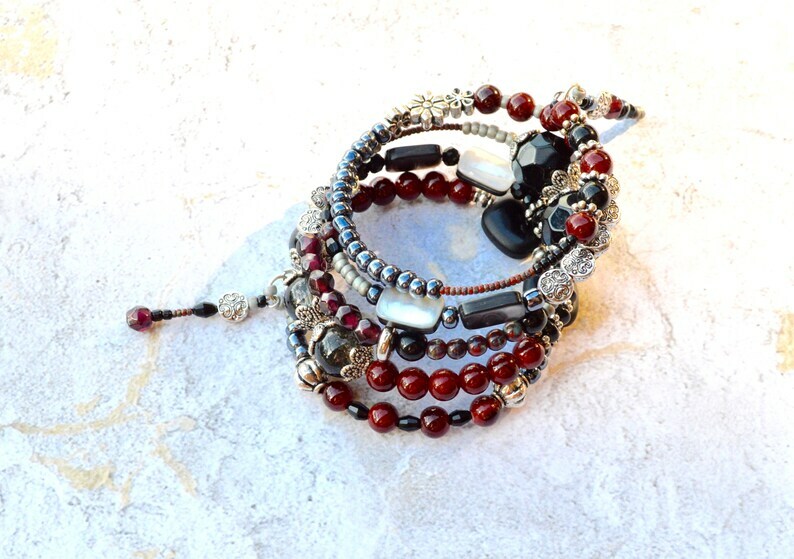 This wrap bracelet makes an excellent gift for someone special or a nice treat for yourself. Each bracelet comes in a black organza bag. * I use memory wire for all of my wrap bracelets. It’s very strong and will not break. I use to make bracelets with the string but it broke a lot and beads would be everywhere and I would be very frustrated with it…not memory wire!!! !